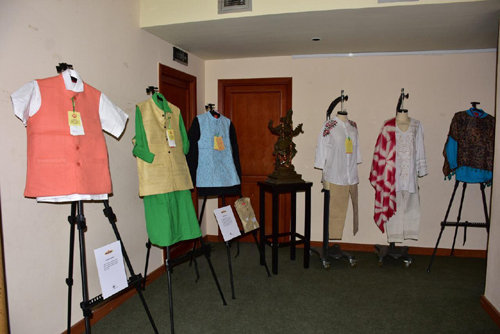 As a part of the celebrations of the 150th anniversary of the birth of Mahatma Gandhi, the Embassy of India in Cairo held an exhibition on khadi cloth products at the Maulana Azad Centre for Indian Culture (MACIC) premises in Zamalek on Friday. 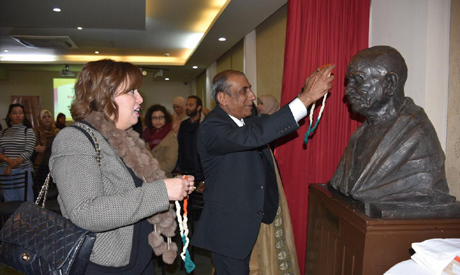 The exhibition was inaugurated by Ambassador of India to Egypt Shri Rahul Kulshreshth, and Director-General of the International Relations at the Egyptian Businessmen Association Dalia Youssef. The inauguration included short speeches delivered by the Indian ambassador and Youssef and the screening of a short documentary film on khadi. The one-day exhibition showcased premium products including different fabrics, cosmetics and village industries products. Khadi is usually handwoven from cotton and may also include silk and wool, which are all spun into yarn on a spinning wheel called charkha. It is a versatile fabric, cool in summer and warm in winter. It is natural and organic fabric. In order to improve the look, the cloth is sometimes starched to give it a stiffer feel. It is widely known in fashion circles. Khadi is being promoted in India by Khadi and Village Industries Commission, Ministry of Micro, Small and Medium Enterprises. In 2017, a total of 460,000 people were employed in industries making khadi products in India. Production and sales rose by 31.6 percent and 33 percent in 2017 over the 2016 figures after the multi-spindle charkas were introduced to enhance the productivity.